Singrid Marie Sanders Thompson is a Licensed Esthetician and freelance makeup artist from Tuscaloosa, Al who has turned her hobby into a passion. As a teenager she loved to play in her mother’s makeup bag. Never one to leave home without her lipgloss or other signature girly items, she later added eyeshadow to her all time must-haves, making sure her lips and eyes were always fashionable. This was the beginning of her fashion journey. After several career moves, she never imagined becoming a Makeup Artist would be included in her list of “things to do”. Tired of feeling like there was so much more that she could offer the world, she prayed and asked God to show her her purpose, realizing that His answer was that she should offer her help to those in need. She then began to increase her makeup collection out of hobby, and later she realized that this is exactly what she wanted to do to help others. While researching, God gave her a name “iMakeUp me”. “iMakeUp Me” stands for “I make up me, as beautiful as I am. My flaws and all are who I am. As imperfect as I am, God still loves me”. 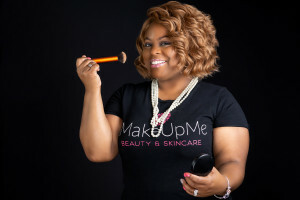 A part of her vision was opening up iMakeUpMe Beauty & Skincare. A place where ladies can come to relax, receive a glamorous experience, and leave looking as confident and beautiful as they are on the inside. “Enhancing Your Natural Beauty” is the main objective that Singrid tries to achieve, believing that each person will have a beauty “experience” at the iMakeUp me Beauty Bar. In other words, “We don’t book appointments, we book experiences”. She has been working non stop making sure she is living her dream!